Blended Learning Workshop @NJC 2011 July07. change is needed in the culture of teaching and learning so that ongoing, situated, participatory, and collaborative approaches are accepted. - SG has MP3 that focus on SDL n CoL with ICT. Constructions (perhaps getting students to do some inquiry on simulations, blog about what they learnt, what was useful etc). Giving students a voice, Democratizing Knowledge everyone can learn and create, everyone is important. allow for opportunity to Self Directed and Self Pace learning. The supplemental model retains the basic structure of the traditional course and uses technology resources to supplement traditional lectures and textbooks. 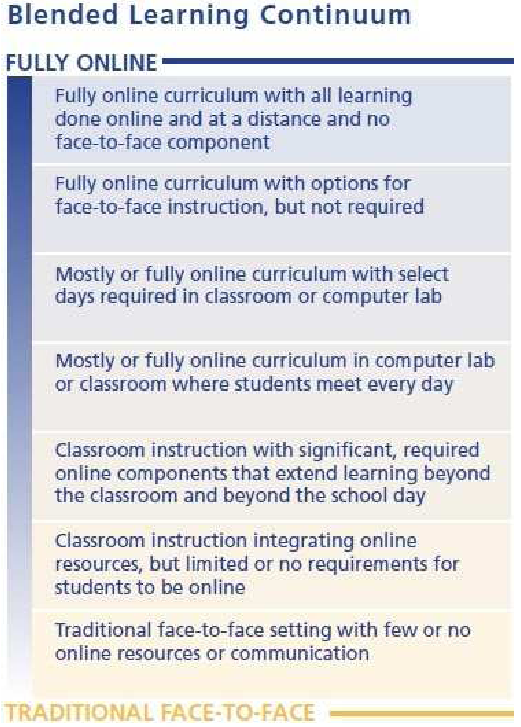 The supplemental model for blended learning incorporates technology into the instructional approach of the course, but does not alter its basic structure. Students may be required to complete online readings or activities, or participate in lab sessions. However, there is no reduction in course meeting time under the supplemental model; a three-hour course would still meet in-class for three hours per week. My take is implementing BL takes time, perhaps a supplemental model could be a beginning phase to start with. makes significant changes in remaining in-class meetings. Under a replacement model, there are fundamental changes to the course. Unlike the supplemental model, the online resources in a replacement model are fully integrated into the overall instructional effort. The online content acts as a replacement for time that would have been spent in a lecture hall. Consequently, the nature of the in-class activities is changed as well. Instead of traditional lectures, in-class time is freed for more interactive, collaborative learning experiences. My take is likely not going to happen in SG, a small place where traveling to school is probably mandatory, except for those learning at home week. The emporium model eliminates all class meetings and replaces them with a learning resource center. This resource center, typically a large computer lab, offers access to course online materials in addition to live assistance and guidance. The emporium model is a radical re-conceptualization of the traditional course. Though attendance at the learning center can be required, there are no longer lectures in a traditional sense. Course content is delivered via online materials, and in-person help is provided in the learning resource center. My take is it seems to be pretty Future School type of scenario, probably would see it anytime soon. can embed java applets, critical for experiencing through learning by inquiry through simulations etc. Ultimately, the choice is a personal one, you have to decide for yourself. PLC Pilot Study Wiki (2010) ‎education‎Shared with 5 peoplePLC Pilot Study Wiki for year 2010. Course Description (Background)Schools in Singapore are well equipped with numerous stand-alone ICT tools for teachers in planning ICT-supported lessons. However, not all educators have the knowledge and skills to conduct online learning as well as face to face classroom learning. Many e-learning lessons are either standalone, or not well connected to the face-to-face lessons, with the uploading of lectures notes and video presentations serving only as a repository of lesson archives. Location: Computer Lab BYTZ for learning by doing. arrangements. Journal of Educational Media, 28, (2–3).